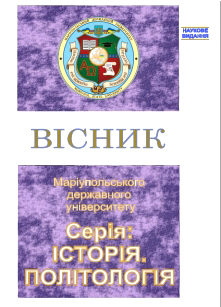 Compilation of articles «Journal of Mariupol State Univeristy. Series: History. Political Studies» was created to study a wide range of challenges of modern historical and political thought that include relevant scientific issues of the history of Ukraine, world history, historiography, source studies, special historical subjects, international relations, external policy of Ukraine and foreign countries, cooperation between political institutions of government, influence of ethno-national factors on the process of building civil society. The Journal is included into international scientometrical databases. The articles shall be submitted to the next issue of scientific articles until May 10th, June 10th, October 10th annually.